During the 6th Territorial Legislature, 101 bills were enacted into law in just 60 days, amounting to an average of over one and a half bills per day. Many of the measures were amendments or additions to previous legislation. Established a $1 bounty on eagles. Allowed Alaska male residents aged 65 years or older and female residents aged 60 years or older to apply for an allowance in order to be cared for at home rather than in the Alaska Pioneer Homes. Allowed for the registration of brands to protect fur farmers. Added non-support as grounds for divorce. Created the Territorial Historical Library and the Museum Commission. Adopted a major revision of laws related to municipal incorporation. Allowed for extradition of persons of "unsound" mind. Prohibited all but "competent miners" from employment as foremen, assistant foremen, or fire bosses in coal mines. Provided for the regulation, sale, disposal, possession, and use of narcotic drugs. Prescribed the qualifications for persons serving as jurors. Revised the general laws pertaining to business corporations. Made provisions for the needy and indigent. Provided that it was unlawful to fish without a license. Fees for licenses were $1 for resident fishermen of all classes, $3 for non-residents who used hook and line, $10 for non-residents using gill nets or set lines, and $25 for non-residents who used seines or set nets. In the Fairbanks and Anchorage-Matanuska districts, the chief agricultural regions of the territory, there are only 90 farmers with around 1,400 acres of cultivated lands (1923). Precipitated by the conversion of U.S. naval vessels to run on oil rather than coal, President Warren G. Harding creates the National Petroleum Reserve in 1923. West of what is now the Arctic National Wildlife Refuge, the reserve is managed by the U.S. Bureau of Land Management. The Teapot Dome scandal erupts over the Secretary of the Interior's accepting oil company bribes for Lower 48 petroleum reserve leases without competitive bidding. On July 15, 1923, President Harding drives a golden spike near Nenana completing the Alaska Railroad. In poor health at the time, he dies less than three weeks later in San Francisco. Congress passes the White Act of 1924, favoring fish traps operated by large canneries. The act works against the development of small fishing operators in Alaska. 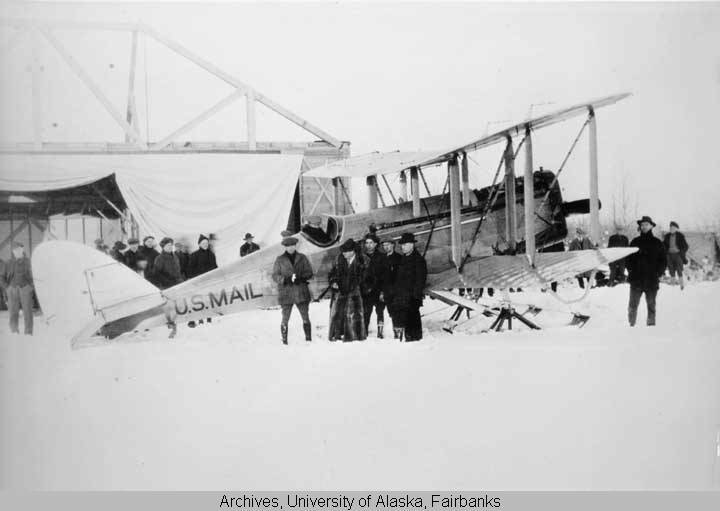 Airmail delivery to Alaska commences (1924). The Indian Citizenship Act of 1924 grants full U.S. citizenship to America's indigenous peoples, called "Indians" in the Act. In Southeast Alaska, significant momentum exists to secede from the rest of the territory in hopes of achieving statehood sooner. The secession movement ends when a key Congressman declares that dividing Alaska in two would never win federal approval (1924).